Exploration and drilling efforts in onshore North America have increasingly moved away from conventional reservoirs and toward unconventional ones. Although advances in drilling technology have been the primary factors in achieving economic viability in these tight reservoirs, 3D seismic data has played an increasingly important role in development success. The economic viability of unconventional reservoirs is primarily due to advances in horizontal drilling and hydraulic fracture stimulation technologies. The ability to drill long laterals allows more reservoir rock to be in contact with the well bore, whereas, hydraulic fracture stimulation creates the necessary permeability pathways in these very tight reservoirs. A key factor in economic success is the ability to create as extensive and complex a fracture network as possible. The fracture network created during hydraulic stimulation is strongly affected by the in-situ stress field, any natural fracture systems present, and the geo-mechanical properties of the rock. Although seismic data was initially considered to be of little use in unconventional reservoirs, over time operators have realized that 3D seismic data can provide significant value by helping to optimize the results obtained from horizontal drilling and hydraulic stimulation. As operators started to drill non-vertical wells and increasingly longer laterals, without the benefit of 3D seismic data the drilling engineer often had trouble staying in zone and encountered drilling hazards such as faults. 3D seismic data allows the mapping of the structure and the thickness of the reservoir unit and the identification of possible drilling hazards. Thus, 3D seismic data has helped to optimize the results of horizontal drilling. Land environments in which the rocks have been buried, compacted and subjected to various tectonic stresses are often highly anisotropic. Wide azimuth seismic data provides an excellent sampling of source-receiver azimuths and offsets which enables the measurement of VTI and HTI anisotropy effects in the seismic data. VTI anisotropy caused by horizontal layering in the geology results in seismic velocities that vary with source-receiver offset or angle and produces the well known “hockey stick” effect on the far offsets. On the other hand, HTI anisotropy, which can be an effect of unequal horizontal stresses and/or vertical aligned fractures, results in seismic velocities that vary with source-receiver azimuth. HTI anisotropy produces a sinusoidal time shift signature on azimuth sorted CMP data (Figure 1). Figure 1. Vertical Transverse Isotropy (VTI) and Horizontal Transverse Isotropy (HTI). Azimuthal analysis of wide azimuth 3D seismic data allows the measurement of the variation in velocity (and amplitude) with azimuth and the determination of azimuthal anisotropy attributes which provide information about stress fields and natural fracture systems. Schlumberger and Devon (JPT, 2008) have shown that during hydraulic stimulation a wide fracture fairway is best achieved under a low differential stress environment and that the measurement of seismic anisotropy can help predict areas most likely to have an optimal stress environment for hydraulic stimulation (Figure 2). In addition, when hydraulic stimulation is required to enhance the recovery of naturally fractured reservoirs, the interaction between the in situ stress field and any existing natural fractures becomes an important issue. 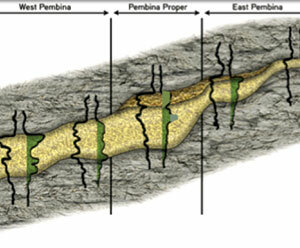 Gale et al (2009) show evidence from the Barnett Shale for a reactivation of natural fractures during hydraulic stimulation that resulted in a widening of the induced fracture fairway (Figure 3). 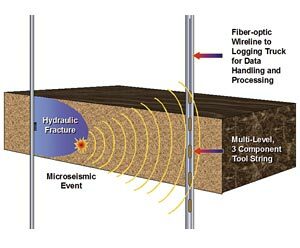 Thus, the ability to characterize natural fractures systems using seismic anisotropy and relate this information to the in situ stress field can help operators to optimize the results of hydraulic fracture stimulation. Figure 2. In-situ stress, seismic anisotropy and fracture fairway width (Journal of Petroleum Technology, September 2008). Figure 3. Natural fracture systems and induced fracture fairway width (Gale et al, AAPG Bulletin, April 2007). Rock brittleness reflects the tendency of a rock to fail under stress and maintain a fracture. Brittle rock is more likely to be naturally fractured and also more likely to respond well to hydraulic fracturing treatments than a ductile rock. Seismic inversion allows the estimation of geo-mechanical rock properties related to brittleness which strongly influence the effectiveness of the hydraulic stimulation (Figure 4). However, the ability to obtain reliable rock properties from seismic inversion is dependent upon preserving the far offset data and adequately correcting for the VTI and HTI effects in the data. Figure 4. Relationship between brittleness and geo-mechanical rock properties (Goodway et al, CSPG CSEG 2007). Accounting for the effects of anisotropy as well as geologic dip in P-wave data processing can significantly improve the quality of the seismic image and the estimation of anisotropyrelated attributes and geo-mechanical rock properties. Recently it has become standard practice to perform Prestack Time Migration (PSTM) prior to azimuthal velocity analysis to account for dip and provide improved imaging. By performing the PSTM in the Common Offset Vector (COV) (otherwise known as Offset Vector Tile) domain, offset and azimuth information is preserved allowing for successful post-migration characterization of the azimuthal anisotropy. In addition, both VTI and HTI anisotropy can be incorporated into the PSTM resulting in improved imaging. An example of incorporating VTI and HTI anisotropy into a COV PSTM is shown in Figure 5. In Figure 5a data from a wide-azimuth land survey are imaged with a conventional PSTM and an isotropic velocity field. Figure 5b shows the same data imaged with an azimuthally anisotropic PSTM also incorporating a VTI component. The imaging of the steep dips is clearly improved as is the imaging of the flatter reflections, mostly due to incorporating the azimuthal velocity variation. In this talk I shall show several field data examples of the two forms of anisotropy on wide-azimuth land seismic data and discuss in more detail the processing and imaging steps necessary to both correct the data and obtain anisotropic attributes. I will also discuss the potential use and interpretation of the azimuthal anisotropy attributes. Figure 5. PSTM stacks using: a) isotropic velocity field and b) anisotropic velocity field. Azimuthal anisotropy is becoming increasingly used as a tool for characterizing subsurface stress regimes, rock brittleness and natural fracture systems. These subsurface properties can help optimize hydraulic fracture treatments which are particularly important for unconventional reservoirs. In addition, accounting for seismic anisotropy in seismic data processing results in improved imaging and therefore enhances the ability to accurately place wells and keep horizontal well bores in the reservoir zone. The author would like to thank ION Geophysical for permission to present this material. Edward Jenner – Manager, Research and Development, graduated from Birmingham University, UK with a B.Sc. in Physics with Astrophysics and from Leeds University, UK with a Masters in Geophysics. In 2001 he completed his Ph.D. in Geophysics at the Colorado School of Mines in Azimuthal velocity and AVO analysis. Since 2002 Edward has been manager of land research and development for ION with particular interests in the areas of anisotropy, AVO and imaging. Prior to 2001, Edward worked for BP investigating amplitude preserving multiple removal, at Conoco working on statics and pre-stack depth imaging and at CGG developing a technique for converted wave pre-stack depth migration. In 2003, Edward was awarded the SEG Clarence Karcher Award for his work in the field of azimuthal anisotropy. Gale J. F. W., R. M. Reed, J. Holder, 2007, Natural fractures in the Barnett Shale and their importance for hydraulic fracture treatments , AAPG Bulletin, Vol. 91, No. 4, 603-622. Goodway W., J. Varsek, and C. Abaco, 2007, Isotropic AVO methods to detect fracture prone zones in tight gas resource plays , CSPG CSEG Convention, Expanded abstract. Grigg M., 2004 Emphasis on mineralogy and basin stress for gas shale exploration: SPE meeting on Gas Shale Technology. Parshall J., 2008, Barnett Shale Showcases Tight-Gas development , JPT, September, 48-55. Williams M. and E. Jenner, 2002 , Interpreting seismic data in the presence of azimuthal anisotropy: or azimuthal anisotropy in the presence of the seismic interpretation , The Leading edge, 21. No. 8, 771-774.